"When another by-election occurred in South Longford in April, Collins enthusiastically proposed as a candidate a local man, Joseph McGuinness, who was serving a sentence in Lewes jail. The idea met with considerable opposition… On his (Eamon DeValera’s) instructions, McGuinness refused to allow his name to go forward. Collins ignored de Valera and went ahead anyway, adopting the ingenious slogan, ‘Put him in to get him out.’ He went to Granard in County Longford and threw himself heart and soul into the campaign which, as de Valera had predicted, was closely fought. On the first count Patrick McKenna, the Irish Parliamentary Party candidate, was elected by a narrow margin, but ‘a bundle of uncounted votes was then discovered’ and McGuinness was declared the winner by thirty-seven votes. Many years afterwards the respectable chairman of an Irish building society explained to Collins’s biographer, Tim Pat Coogan, how the bundle (of uncounted votes) was discovered. ‘I jumped up on the platform, put a .45 to the head of the returning officer, clicked back the hammer, and told him to think again.’"
"Among the close friends Collins made at this time was Thomas Ashe who was, after de Valera, the most senior of the 1916 rebel officers to have survived, and who had been elected head of the IRB. In August 1917 Ashe was arrested and charged with making a seditious speech at Ballinalee in County Longford. Collins, who had shared the platform with him at the meeting, visited him in the Curragh detention center, and attended his court martial two weeks later. At this stage Collins treated the prosecution as a huge joke, telling Ashe’s sister it was rather like Gilbert and Sullivan’s Trial By Jury… By now there were about forty prisoners in Mountjoy jail convicted under the DORA (Defense of the Realm Act) legislation, and they began to organize themselves to demand special status as political prisoners. When they broke prison rules they were punished by having their boots and bedding removed, and they then went on hunger-strike. The authorities’ response was forcible feeding, so inexpertly administered that on 25 September Ashe suddenly collapsed. He was taken to the Mater Misericordiae Hospital where he died a few hours later… Sinn Féin had been given a propaganda weapon that they were able to use to enormous effect throughout the world, and particularly in the United States. Collins, in Volunteer uniform, delivered the graveside address, and afterwards was observed weeping bitterly" (A.T.Q. Stewart). "In defiance of government regulations, the Volunteers were armed and in uniform when they escorted 30,000 or 40,000 mourners, including Catholic priests and trade unionists, to [Ashe's] graveside at Glasnevin cemetery. There was no oration. Three volleys were fired and the Volunteer commander, a big fellow with the insignia of a vice-commandant, gave a brief valediction in Irish and English. ‘Nothing additional remains to be said,’ he declared. ‘The volley which we have just heard is the only speech which it is proper to make above the grave of a dead Fenian.’ The speaker, so forthright and simple, utterly different in manner from the poetic and mystical Pearse, had been an aide de camp to Joseph Plunkett in the GPO, suffered imprisonment afterwards and campaigned for Count Plunkett at North Roscommon. He was Michael Collins" (Peter & Fiona Somerset Fry, A History of Ireland). "He would obtain information from a wide variety of people. For instance, he had constructed a network of people among the railway men, who carried messages to him from the country and back again from him to the different brigades. Another group worked in the Post Office intercepting letters... Collins had a knack of picking up miscellaneous sources of information which he could use to complete the mosaic... It was typical of Collins that he would use a place as innocuous as a public library to coordinate his various sources of information" (Ulick O'Connor). Collins had a great friend in Joe O'Reilly also. O'Reilly was a young man recruited by Collins for the National Aid Association and quickly became a close, beloved friend. He was an assistant willing to do anything Michael asked of him, including putting up with temper tantrums and verbal outbursts. Michael Collins had to be one of the hardest working men in Ireland at this time, sometimes devoting only three or four hours a night to sleep. 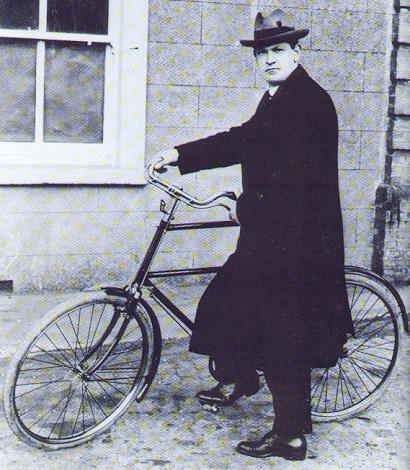 Aside from earlier duties he maintained, he would ride around Dublin on his bicycle delivering messages personally. Collins was employing the strategy Chesterton wrote about in The Man Who Was Thursday—he knew the British would expect him to be in hiding and thus staying out in the open was the smartest thing to do. "It seems to be an iron law with policemen both in Collins' time and ours, that terrorists are not expected to wear pin-striped suits and clean collars and ties" (Coogan). "On the desk in front of him, neat heaps of reports and bundles of papers were ranged round the typewriter—these and a glance at the maps on the walls, and Mick knew every man hostile, friendly or useful to him and the theatres and fortunes of the Little War. Sometimes Mick worked twelve, fifteen, even eighteen hours a day, going on till he dropped. A lion for work. Barely two or three years ago this young man was unknown. Unknown to the readers of his escapes. Unknown to those who were thrilled by a sudden legend sweeping from the Dublin gossips and the British Secret Service to fill the columns of the world’s press. But the London-Irish had known the son of the Clonakilty farmer listening to the Hyde Park orators with intent ear and twinkling eye, shocking staid enthusiasts among the exiles with his whirlwind manner and expletives, an alert and dashing figure on the hurling or football field, orating in the political clubs or hanging over the galleries of the London theatres" (Ryan, Desmond). "One day during my (Tom Barry) stay he (Collins) left our lodgings to meet his Intelligence Assistants at his office at 9 a.m. He attended a Cabinet meeting at 11 a.m. After lunch he was back at Intelligence at 1:30 p.m., then in Conference with the Propaganda Department for an hour whence he traveled to meet some seamen who were smuggling in a small quantity of small-arms. From there he traveled to another office to meet a number of people from the country who had large amounts of money for the Dail Loan which Collins had successfully launched. He reached us at Vaughan's Hotel at 6:30 p.m. and after swallowing his tea, went upstairs to his private room to meet separately officers from five different country units. I was present with him during those interviews, which continued until 10 p.m., when Collins seemed to be as fresh as when he breakfasted in the morning" (Barry). Collins has been labeled a snappy, debonair dresser and his presence as a clean-cut businessman probably saved his neck on countless occasions. During his interview for The South Bank Show, historian John Regan noted that Collins's "contemporaries recalled of him that he was always immaculately dressed― dapper rather than ostentatious. And he effected the appearance of a businessman and that in essence was exactly what Collins was by the time he returned to Ireland: a young businessman." Another factor was Collins's own personality. "Part of his immunity to arrest seemed to stem from his audacity... On [one] occasion, Collins and Detective Eamonn (Ned) Broy, his 'Castle spy,' were stopped by the military at Baggot Street Bridge. 'I was terrified,' Broy recalled... 'Collins had his socks full of papers, with names on them and military codes. If he was caught, I was caught with them too... Believe it or not if the impudent fellow didn't go straight up to the officer in charge of the search party and start to chat to him. The officer fell a victim to Mick's charm, who soon had him roaring laughing. The other soldiers, seeing Mick chatting to their commanding officer, assumed he was a friend and we were let through without examination. I was sweating but it didn't seem to take a feather out of Mick. He was chuckling all the way... to his office'" (Ulick O'Connor). "Collins had time to say, 'Act drunk' before we were ordered off the car to be minutely searched. I was next to Collins and he put up such a fine act, joking and blasting in turn, that he had the whole search party of terrorists in good-humour in a short time. Collins and the others appeared to be quite unperturbed, but I, being searched for the first time and never having seen Auxiliaries before, except to fire at them, felt anything but happy." "To one of the officers from a particularly inefficient Unit who asked for arms, Mick, with a scowl on his face, his hands deep in his pockets, his right foot pawing the ground, shot back, 'What the Hell does a lot of lousers like you want arms for? You have rifles and revolvers galore but you have never yet used them. A single bousey (defined by Barry as a "disreputable person") like X (a Black and Tan) is walking around your area alone for six months terrorising and shooting people and ye are afraid to tackle him. Get to Hell out of this and do not come back until ye have done some fighting.' Collins continued to swear as the officer hurriedly left the room." "The main leadership problem facing Collins during the War of Independence was that while he did influence and direct others to accomplish the mission, he had not got the level of military command to do so. It was rather his charismatic nature and his reputation for decisiveness that led people to seek him out for assistance and advice" (Peter Young, "Michael Collins: A Military Leader" Michael Collins and the Making of the Irish State). "He was quite ruthless, and to a disturbing degree a law unto himself. He was both boisterous and abrasive. He made enemies but he also inspired immense loyalty. He recruited remarkable collaboration from within opposing ranks, but there is no evidence that the British, from whom he had several narrow escapes, did not want to capture him. He more than anyone succeeded in disrupting their nerve centre. In May 1922 Lloyd George told Collins that if he had been caught he would have been shot. One aspect of IRA discipline may be mentioned. Michael Collins was absolutely opposed to punishment beatings or floggings ‘for any offence, under any circumstances, even as a reprisal,’ writing on 3 July 1921: ‘It has a more degrading effect upon the person or the authority administering it than the person to whom it is administered.’ Joseph Connolly, Fianna Fáil Minister in the 1930s, wrote in his memoirs: ‘I am, by nature, little disposed to anything in the way of hero worship, but I have always been convinced that during the fateful years from 1919 to 1921 the one man, who more than any other carried the Herculean load of Ireland’s fight, was Collins. It would scarcely be necessary to say so, but for the evens that followed the Treaty and which to many obscured the real qualities and genius that made Collins what he was'" ( Martin Mansergh, "'The Freedom to Achieve Freedom?' The Political Ideas of Collins and De Valera" Michael Collins and the Making of the Irish State). "The British made ludicrously high estimates of the numbers of their enemy; [Field Marshal] French reckoned that the IRA consisted of 100,000 men and his chief secretary 200,000, whereas the true figure was nearer 15,000 and, according to Collins, not more than 3,000 of those were trained and active gunmen. Then on 21 January, the first anniversary of the setting up of the Dáil, an IRA group run by Collins and called The Squad killed an assistant commissioner of the Dublin police as he went from his office in the castle to his hotel. The Castle authorities offered £10,000 for evidence leading to the conviction of the killers and a further £10,000 for Collins, dead or alive" (Peter & Fiona Somerset Fry). Meanwhile, the British had prepared a list of key Sinn Féin members to gather up. Raids and captures in the month of May were planned for those living in Dublin. Collins's infiltrators knew this information of course and passed it along to him accordingly. Not all of his cohorts believed this news and stayed home only to be arrested with the hopes of generating a public outcry. "During the night of 17 May (1918) de Valera, Griffith and almost the entire leadership of Sinn Fein, all those thought most likely to organize resistance to conscription, were arrested on the flimsy pretext of a German plot; Irish Americans had never ceased their exchange of messages with the Germans, and a member of Casement’s Irish brigade had been picked up in April after landing from a submarine, ostensibly to find out if there was any prospect of another Irish rising. Michael Collins had purposely kept out of the way, but the rest of the leadership, though warned, preferred imprisonment, with its political advantages, to going on the run" (Fry). Collins went off to England to break DeValera out of gaol after the raids and several accounts vary on this matter. It has been written that Harry Boland was the mastermind behind DeValera's escape while many other sources credit the bust to Collins. The general story is that DeValera acted as an altar attendant in the gaol's chapel and made a convenient wax copy of the main key using a hot candle after one of the services. He mailed the wax model to Collins and Collins made several copies. He made it to the gaol, tried his copies, and ended up getting a piece of one stuck in the keyhole (as depicted in Michael Collins). DeValera had a spare copy and made it out. In any event, Eamon absconded and Collins was elected Minister for Finance and was additionally named Director of Organization and Director of Intelligence for the Irish Volunteers. "The Dáil had its second meeting on 1 April and chose Eamonn (sic) de Valera, recently sprung from Lincoln gaol, as its president. The following day he nominated Griffith, who had just been released from prison, as minister for home affairs, Collins as finance minister, Count Plunkett as minister for foreign affairs, Cathal Brugha, a tough and heroic fighter who had been badly wounded during Easter Week, as minister for defence and Robert Barton, a landowner educated in England, as minister for agriculture" (Peter & Fiona Somerset Fry). "At one point a window in the office was broken by a drunken soldier outside, and if the police had come to inspect the damage Collins would probably have been discovered. When he read, near the beginning of his file, that he came from a 'brainy' family in Cork, he burst out laughing, to Broy's alarm." The Castle was able to operate because of the tips given to its workers by paid informants. The solution, Michael reasoned, was to eliminate the link—no prying detectives meant no information for the British. "In the IRB, Collins combined in himself the roles of Clarke and MacDermott; they had recruited others to do the work; Collins did it all himself. The Chief of Staff of the Volunteers, Richard Mulcahy, was an IRB man, as were almost all the GHQ staff. But they were essentially Collins’s men. Collins was the brain of the nationalist resistance. When country guerrillas needed arms and advice they went to Collins. He built an effective intelligence system, infiltrated Dublin Castle and eliminated its agents. For a century and a quarter, Dublin Castle had subverted all Irish rebel movements. Collins subverted Dublin Castle" (Sean Cronin). As one can well imagine, Collins was not a man to be trifled with. * There has been some dispute as to whether such a high price was ever put upon Collins' head by the British. This is, perhaps, part of a desire for such matters to remain cloaked in secrecy because £10,000 is still a good sum of money. Winston Churchill was later to reminisce about an occasion when he met with Arthur Griffith, Lloyd George, and Collins at his home. He recounted that Lloyd George and Griffith left the room to talk alone, leaving Churchill and Collins together. Churchill said Collins was "in his most difficult mood, full of reproaches and defiances, and it was very easy for everyone to lose his temper." Collins pointed out that the British had relentlessly hunted him, putting a price on his head. Churchill took his reward notice from the Boer War off the wall offering £25 for him dead or alive. It has been said that Churchill later recanted this tale, alleging that the British government did not offer a reward for Collins' capture. Again, researchers are plagued by the conflicting authority regarding Collins' reward note.